I was 19 when I made this one. (My very first Gingerbread house!) 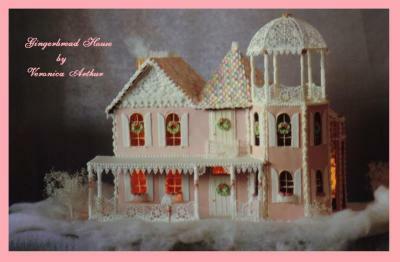 I entered it in the 1988 Good housekeeping Gingerbread house contest and won 5th place! That's prety good considering I had started decorating cakes only 2 years before that! The rails and the gazebo on the tower and all the "lacey" looking pieces are all made completely of royal icing. I would buy one of these. I love it!!! wow!!! i absolutely love it. its sooo gorgeous. well done i am proud of you and if you have any more please show me! Very, very good! I'm really impressed with your work. Hard to believe it's your first gingerbread house!! But coming from you, It doesn't surprise me. You have some outstanding skills, my friend!!! I'd love some closer shots if this if you have any. The ornamentation is fantastic, especially the gazebo (and the idea to work it into the roof!). Curious about the rear and what the middle roof is tiled with. All these questions. That's why I love it! Fine job. Very beautiful! You've always been so talented.